This past year has been very busy for Elphinstone Logging Focus (ELF). 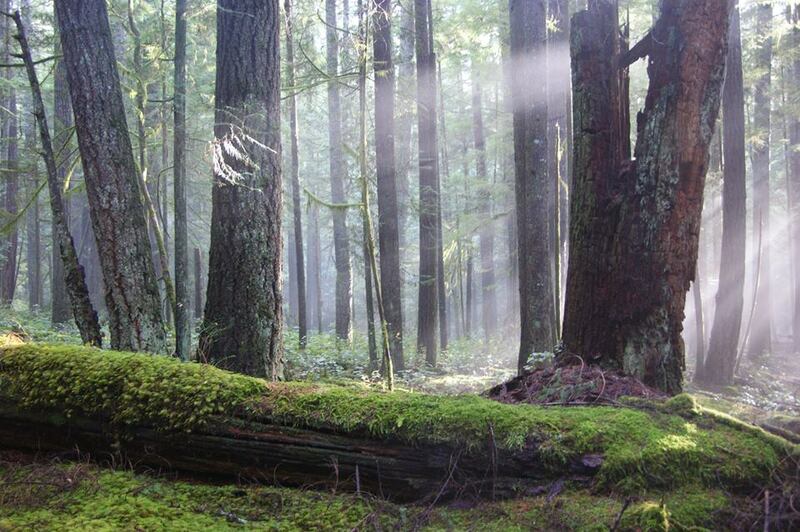 We undertook several important forest campaigns, including protection of the Dakota Bowl Bear Sanctuary, Ecological Reserve protection for the Roberts Creek Headwaters Forest, stopping logging in the Chapman Creek Drinking Watershed, and the building of several new trails, including an extension of the Elphinstone Health Trail to be open early 2015. We also hired one of Canada’s foremost conservation-biologists to conduct an updated ecological study of the 1,500Ha Elphinstone forest zone. One campaign that has taken considerable time & effort and a key area for our Mt. Elphinstone Prov. Park expansion area, is the Clack Creek Gallery Forest. It’s an important low elevation forest on the slopes of Mt. Elphinstone, but it’s also a BC Timber Sales proposed cutblock of an intact, natural forest (not a tree farm). It was scheduled to be sold and logged in 2012, however ELF’s involvement compelled BCTS to re-plan the block 3 times, to provide a buffer for the popular Wagon Trail, a wider riparian zone for Gough Creek, and protection of an endangered native plant, all of which delayed their schedule. A new trail now crosses through this forest, where over 30 plaques designed and made by residents, express their connection to this magical place. ELF is also presenting this area to BC Parks for nomination as a protected Ecological Reserve securing the largest site of endangered Rubus Nivalis (snow bramble) in the Province. 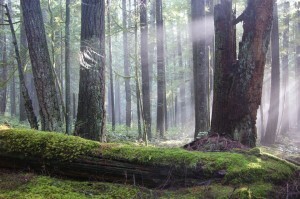 This forest will continue to get our attention until it’s fully protected. ELF relies on individual donations to fund our activities and we’re making our annual appeal to folks like you who have been following us in the news. Donations go into our war chest and allow us to do public outreach and hire professional researchers to support our forest protection claims. Please donate what you can. As our last 2014 fundraising appeal, we’re offering a frameable 8” x 12” color print of the Elphinstone forest scene pictured below, as a special thanks for all donations of $50. or more. The image is classic Elphinstone showing its old-growth characteristics. The light was near perfect, creating this dramatic shot with lots of depth. If you don’t want the print, please make a note and include it with the mailed donation, or email us to that effect. Thank you for your continued interest and support as we head into another important forest protection campaign year. P.S. Mark your calendars for Tuesday, December 30th at 1PM to join us on a guided walk along the ‘Elphinstone Health Trail’. Meet on the B & K Rd (off Hwy 101 in Roberts Creek) at the powerlines. Back by 4:30pm.